Seasonal times Closed 25 Dec. Open noon–5pm on 26 Dec, 1 & 2 Jan. In its landmark building, occupying more than half of Chambers Street, the National Museum of Scotland was formerly two different museums – the Royal Museum, built in 1861, and the more modern Museum of Scotland, completed in 1998. The facilities were unified in April 2008, although there is still a definite thematic separation: the former Royal Museum (complete with its grand Victorian Hall) has a worldwide and natural history focus, while the newer building maintains a distinctly Scottish viewpoint. Between the two is an interactive technology zone, filled with exhibits that form an easy connection between education and fun for children. They can race in a Formula 1 simulation, operate robotic arms and moon buggies, and discover the science behind solar and rock power. Dolly the Sheep also inhabits this space, as does the full-size Wylam Dilly locomotive. At the top of the spherical sandstone tower at the George IV Bridge end of the building is the Tower Restaurant, which has made a name for itself as a fantastic example of fine dining in the capital. 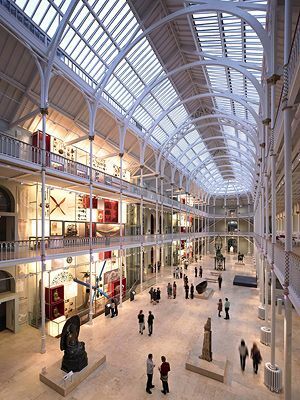 Fire your imagination at the National Museum of Scotland, one of the UK’s top 10 visitor attractions. Our diverse collections take you on a journey of discovery through the history of Scotland, the wonders of nature and world cultures – all under one roof. From meteorites to monsters from the deep, our Natural World galleries tell the story of our planet, while our World Cultures galleries link people and possessions across the globe. Follow the story of Scotland from prehistory to the present day in our Scottish galleries, marvel at a spectacular array of over 800 objects in our Window on the World and meet the Scots whose ideas, innovations and leadership took them across the world in our Discoveries gallery. Planning a day out at the Edinburgh Festival Fringe can be a daunting task – with a massive 3,548 shows in 317 venues across an entire city, you may not know where to start. Add kids into that equation and it can feel like mission impossible. Following a £14.1 million redevelopment the National Museum of Scotland is set to open ten new galleries on Friday 8 July. The latest phase in a planned £80 redevelopment of the iconic museum in the heart of Edinburgh.